There's now even a whole site www.bluezones.com. Note that I bought the book in-person at a clearance sale, and have no affiliation with Dan Buettner or the Blue Zones. Premise: The book's premise is that some places have the highest rates of centenarians, so let's go there and see what's notable about their ways of living. The book has a smattering of input from scientists but is otherwise personal observations, anecdotes from centenarians, and travelogue of Buettner's "Blue Zone Quest". Outliers: This approach of look at the outliers, "the most successful" is ever-popular in the get-rich-quick genre, but yields mostly spurious correlations. Dan observed that some centenarians are fond of an evening glass of red wine, or port, or Saki. That may be a hypothesis worth investigating but it's a massive jump to conclude that a nightcap will add years to your life. Life is too short to take up everything that seems notable about their behavior without solid evidence for cause-and-effect. 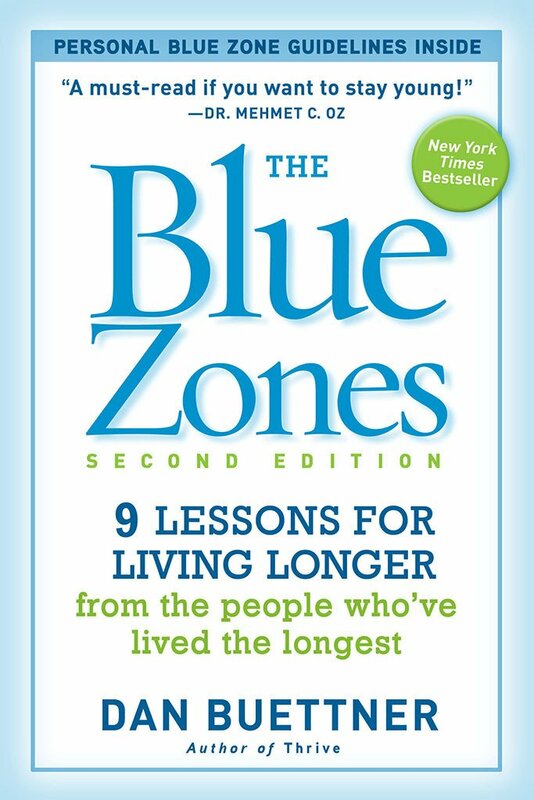 The Zones: Buettner's four "Blue Zones" are "Okinawa, Japan; Sardinia, Italy; Nicoya, Costa Rica; Ikaria, Greece; and among the Seventh Day Adventists in Loma Linda, California" - communities which have well-above-average number of centenarians per capita (see Wikipedia on Blue Zones for more fun places to live...). Genetic factors explain only about 25% of variation in lifespan in twin studies. Risk of dying is how gerontologists define ageing. Increasing age is the overarching factor in the continuous risk of dying, but it's not the sole determiner. Signs of ageing are not universal becoming farsighted, grey hair and loss of hair, loss of collagen in skin - some old people lack one or more of these features. Bodies are like cars built for 200,000km. A few will go to 300,000km or more, but all deteriorate even with the best upkeep. With deterioration comes frailty: when you hit a bump, you are less capable of bouncing back. At some point there's no bounce-back, and then you die. Your chances depend on our age: An 80-year-old has a much better chance of living to 100 is much than a newborn. Looking backwards, most centenarians were quite healthy at 80. Magic bullets: There is no pill that universally "extends life". Anti-oxidants? Humbug: anti-oxidants are better known as preservatives, you'll get more of them from packaged junk food. Vitamins? Get your basic requirements, which is easily attainable by eating fruit and veg. Any more does not help, and large quantities may cause problems. Hormones? Simply dangerous. Forget about it. Diet: reasonable diet, looking for moderation in calories, and balancing the calories across carbohydrates, fats, proteins. Taking in what you really need. Exercise: prefer changes to your lifestyle, over exercise for the sake of exercising. Bike or walk instead of driving. Exercise built into your lifestyle has better chances of being sustained. Swimming is a great cardiovascular exercise. For bones, exercises that use gravity (like walking) are better. Marathon runners have great cardiovascular systems, but their joints give out. Walking helps muscle and bone, without the joint pounding of running. Living more "good years": who wants to live an extra 2 years on life support? The real question is: how can you delay the onset of disability? Aim for "successful aging" rather than mere lifespan. Being socially connected. If nothing else, it makes life more worthwhile. But it's very individual. For example, you can't say that "family support" is universally good: some people are very anxious and upset about their families. Doing something worthwhile. That you find interesting and worthwhile. If your work is driven by internal passion, rather than externalities like money, then it's less stressful. Get rid of anti-aging quackery. It costs you money, and often harms you. Move Naturally: incorporate exercise into your lifestyle. Hara Haichu Bi: Confucian reminder to stop eating when you are 80% full. Combined with eating the right foods, it keeps obesity away. It's the difference between stopping when you are full, and stopping when you are no longer hungry. Weight gain is not from stuffing yourself, rather it's from eating a bit more than you need every day. Prefer foods with lower caloric density. Prefer plant foods. A mostly plant-based diet accented with meat. We do need protein at each meal, but not much. Also, eat legumes. Wine at 5?? This "glass of red in the evening" advice is not on a solid evidence basis. When it comes to health benefits of alcoholic beverages, it's all swings and roundabouts. Sense of purpose: live longer by having something worth getting up for in the morning. Take up something new, so you don't stagnate. Have down-time: regular times to slow down, unwind, de-stress. "Life is short, don't run so fast you miss it"
Belong to a community: Buettner lists religious communities, but presumably communities built around common interests also work. Loved ones first: centenarians typically live in multi-generational homes where younger generations care for the older ones, with strict "honor the elders" cultural norms. That's a rarity now in Western societies, and fewer healthy years for the elders is the price. Being around the right people: the Blue Zones have tight-knit communities and social circles that promote healthy lifestyles. Centenarians also tend to be likeable: "there was not one grump among them". P.S. do you want to use your longer life efficiently? Check out these tips for time management from a system administrator. Do you think Buettner is onto something, or not? Any living longer tips or disagree with the above? Comment below!